UPDATE: Surface Pro 3's right pen button now calls up the radial menu correctly. See below. One of the more popular recent additions to Wacom's Feeldriver is the radial menu, a handy set of shortcuts that can be called up with the click of a pen button. The default RadialMenu offers eight commonly used functions that will apply to most applications. Each wedge is customizable and a profile can be created on an application-specific basis. The radial menu had only been available on Wacom's professional devices until May of this year and its surprise appearance in the enhanced tablet pc driver was another competitive advantage the company had over N-Trig equipped devices like the Surface Pro 3. We were hoping an SP3 pen menu would be part of Microsoft's recently released Surface Hub, but alas it didn't make the cut and a company spokesman was noncommittal about it ever appearing. Some within the Surface team have told me they worry that an OS-level radial menu may conflict with context menus and/or software-specific marking menus like those found in Autodesk Maya. Whether those concerns are valid or not, there's now a powerful utility that brings a highly-customizable radial menu to all devices and throws in a toolbar/ArtDock creator as well. RadialMenu is the brainchild of independent software/game developer Clint Huegel, who wrote the utility for his Motion Computing LE1700. Fortunately for us, the program appears to work with a wide variety of hardware and software combinations. "RadialMenu is a small project I started to alleviate aggravations I encountered while using my TabletPC," Huegel writes on his website. "The goal was to emulate the radial menu that Wacom distributes with some of their products but with per application menus. Since that goal was met a Toolbar was added as well." The RadialMenu application also includes a toolbar that can be easily customized. In this view, the toolbar is collapsed with the center (Up arrow) icon. The arrows on the right allow you to move the toolbar around the screen. Tapping on the pie icon switches to the radial menu. Right-clicking on the radial icon brings up the settings options. See below. The RadialMenu settings. The Menu Size allows you to scale the wedges. Along the bottom, you can create, copy or delete application profiles. The RadialMenu's options are set in this window. Menu Follows Mouse attaches the menu to the pen cursor, although I had trouble reaching the commands in the right half of the pie with this option set. As a utility in development, RadialMenu still has some issues to be ironed out on various devices. I haven't been able to trigger the menu with a pen click alone on the Surface Pro 3. I use the keyboard trigger shown here (Ctrl-Shift-Z) and then tap to switch between the toolbar and radial menu. UPDATE 10/22/15 RadialMenu's developer continues his torrid pace of development and today released version 0.2.3.83 which corrects many of the issues I identify above. Now, setting RadialMenu to load on startup on my Surface Pro 3, I can hold down the right pen button and tap on the desktop to call up the radial menu. Right button + tapping again (away from the center and the command wedges) brings up the standard Windows context menu. Right button + tapping on the center will call up the RadialMenu settings. Problems persist with Menu Follows Mouse. When the UI is scaled to 100% or 125%, the radial menu icons can be accessed normally, but at 150% or above, I can't reach the lower right icons. Look for alternate version 0.2.3.83 x64 at http://radialmenu.weebly.com/download.html I wasn't able to run the standard version listed on that page. To customize the individual RadialMenu wedges, right click the wedge to edit. In addition to several preset options, you can also define a hotkey toggle or create a Macro command (see right). Editing the functions of the toolbar works the same way as the radial menu. Just right click and select your desired function. By default, the toolbar consists of five rows and two columns. The individual buttons can be scaled and the top row of icons can be individually hidden. Auto collapse will shrink the toolbar when you mouse away from it. Expanding the number of available items in a toolbar is a simple matter of increasing the available rows and columns. If you don't like the pie wedges of the default RadialMenu, the size, shape and color can be edited in a wide variety of ways. 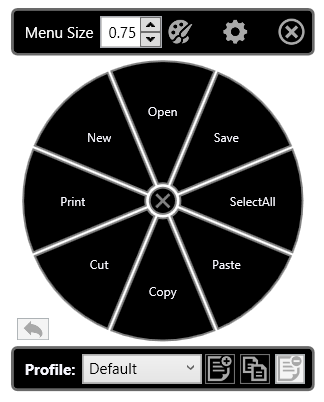 The developer may have set out to emulate Wacom's radial menu, but it's clear that this utility is significantly more powerful than the original. I've encountered a few bumps as I've tested, but Huegel has been quick to post fixes. You can download RadialMenu for yourself at radialmenu.weebly.com and either leave comments or questions in that site's forum or participate in the forum threads over at TabletPCReviews. Although RadialMenu is free to download and install, I plan to contribute a few bucks to reward the developer for his efforts and encourage the utility's further development. I hope you will too.